I was sick a couple days ago. As the day wore on, the question of whether I was feeling well enough to go to the bar came up. Fully aware that Her Worship’s sanity’s edges were starting to fray a bit from seeing no one for five days other that Yours Truly and a reportedly handsome plumber, I felt the risk/benefit analysis tipping toward a night out. Still I waffled, knowing that I should stay home and watch bad TV under a blanket. 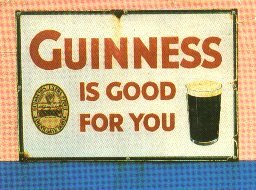 Eventually, a very old marketing campaign found its way to the front of my consciousness: Guinness is good for you! Several hours and two pints of the black stuff later, I was right as the mail. Obviously, the only conclusion possible is that the adage, first revealed to me in 1986 on a postcard sent to my grandmother which now hangs on my refrigerator, is indeed true. This entry was posted in Uncategorized on December 3, 2005 by gala5931.